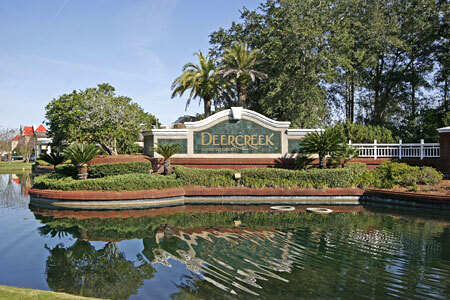 Deercreek Country Club community in Jacksonville, Florida. Welcome to Deercreek Country Club, a gated community featuring acres of luscious landscaped terrain and one of the finest in recreational facilities as well as a championship 18-hole Robert Miller designed golf course in 850 acres of pristine woodlands. Club amenities include clubhouse, junior Olympic swimming pool, full main dining room, separate private rooms, men's and women's card rooms, locker rooms, locker room attendant, lounge, tennis center, 8 lighted Har-Tru clay courts, tennis shop, spectator area, ball-machine, tennis leagues, fitness center, golf course, driving range, golf pro-shop, putting green, golf tournaments, professional golf staff, club repair, and more. Residents are surrounded by 285 acres of preserved wetlands swarming with wildlife, rolling upland pine forests and sunshine year-round. The real estate market is made up of single-family housing, villas and estate homes, many with equestrian facilities. Other homes offer excellent golf course views and/or locations. Land is available for custom building as well. 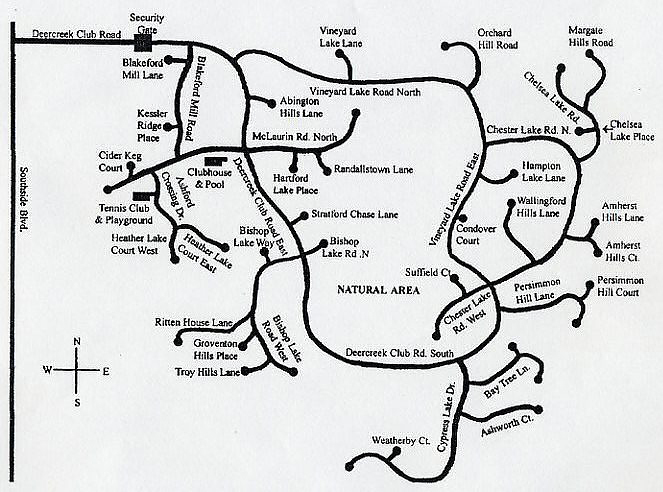 Click for Deercreek sitemap.